We start the new year with our usual blend of music and hysterics, with happening over Christmas and New Year and 8 rather brilliant pieces of music. European Podcast Award – just over a week to get your votes in! 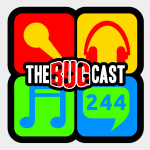 The next show will be episode 245, which will be broadcast live in the chatroom on Friday 11 January 2013 from 21:30 UK time.